Land. Sea. Air. SPOT has you covered around the world. SPOT offers peace of mind by allowing you to track your assets, notify friends and family of your GPS position and status, mark waypoints, track your progress on Google Maps™ or notify rescue officials in an emergency. 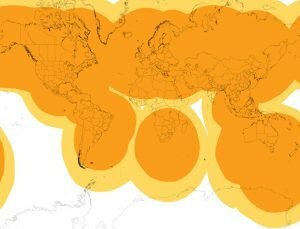 SPOT works around the world, including virtually all of the continental United States, Canada, Mexico, Europe and Australia, portions of South America, Africa, and North-Eastern Asia and hundreds or thousands of miles offshore of these areas. In Russia, the GPS accuracy of your SPOT is limited (degraded) in accordance with Russian regulations restricting the accuracy of GPS performance for devices utilized in Russia. 96% OR BETTER PROBABILITY OF SUCCESSFULLY SENDING A SINGLE MESSAGE WITHIN 20 MINUTES. REDUCED COVERAGE AVAILABLE WITHIN A 20 MINUTE PERIOD. Last Updated 2017-06-07. Estimated coverage area. Actual coverage may vary. Success rates are forecasts for a SPOT messenger to successfully deliver a single message during a 20-minute period, based on network availability. Additionally, in everyday conditions it is normal for some messages to be blocked by your environment, such as hills or buildings. That ‘s why the SPOT Messenger is scheduled to automatically send multiple messages in every mode – giving you excellent overall reliability. 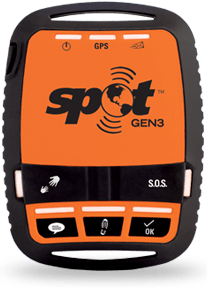 The latest generation of award-winning SPOT devices, SPOT Gen3 gives you a critical, life-saving line of communication using 100% satellite technology.